The mail that people receive every day in their mailbox can be filled with potentially valuable information, including names, addresses, account numbers, financial information and other personal identification information. The information found in a single letter can be used by someone to commit identity theft under California Penal Code Section 530.5 PC or a variety of other fraud-related offenses. 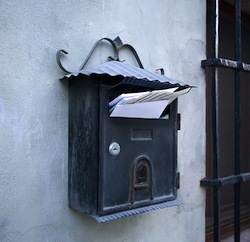 As a result, mail theft is a crime that is specifically prohibited by California Penal Code Section 530.5(e) PC and can result in significant penalties for those convicted. OR the defendant willfully and maliciously injured, defaced or destroyed any mail deposited inside. As this offense deals with the United States Postal Service and interstate commerce, the defendant could be prosecuted for mail theft in Federal Court. A man walks through neighborhoods during the day when people are at work. He checks unlocked mailboxes to see if there are checks, credit cards or any other pieces of mail that may be valuable to him or others. The man proceeds to remove the mail he finds valuable and keeps it. The man could be charged with mail theft under California Penal Code Section 530.5(e) PC. Additionally, if the man actually uses the personal identification information he discovered in the stolen mail, he may also be prosecuted for identity theft pursuant to California Penal Code Section 530.5 PC. In another example, a man in a new apartment receives mail addressed to the former tenant, who neglected to update his address. The man brings the mail into his apartment and fully intends to put it back in the mail with a “Return to Sender” notice, however he forgets to do this. The mail sits in his drawer for several months. This man would not be guilty of mail theft as he did not maliciously steal the mail, even though it did belong to someone else. As described above, there may be instances where this offense is committed inadvertently by someone who did not realize that he or she was taking mail belonging to another person. In these instances, the defendant would have a strong accident defense. Additionally, where the defendant lacks malicious intent, there would be no criminal liability under the mail theft statute. This would apply in instances where the defendant took mail in order to deliver it to its rightful owner or for another lawful purpose. Mail theft under California Penal Code Section 530.5(e) PC is a misdemeanor offense that is punishable by up to a year in jail and a $1,000 court fine. A variety of other conditions of probation may additionally be imposed by the sentencing judge. In addition, this offense could be charged by Federal prosecutors and prosecuted in Federal Court. If convicted in Federal Court, the penalties would be significantly more extensive. If you or someone you know have been charged with mail theft, it is very important that you meet with a knowledgeable Los Angeles Criminal Defense Lawyer as soon as possible. As a former Deputy District Attorney with over 14 years of prosecutorial experience, Los Angeles Criminal Defense Lawyer Michael Kraut has both prosecuted and defended cases of this nature and knows how best to defend those charged with this offense. Mr. Kraut is highly regarded throughout the court system as a tough litigator who possesses an extensive knowledge of criminal law and procedure. For more information about mail theft and to schedule your free consultation, contact Los Angeles Criminal Defense Lawyer Michael Kraut at the Kraut Law Group located at 6255 Sunset Boulevard, Suite 1480, Los Angeles, CA 90028. Mr. Kraut can be reached 24/7 at 888-334-6344 or 323-464-6453.